Romelu Menama Lukaku Bolingoli (Dutch pronunciation: [ˈroːmeːlu luˈkaːku]; born 13 May 1993) is a Belgian professional footballer who plays as a striker for English club Manchester United and the Belgium national team. Born in Antwerp, Lukaku began his professional career at Belgian Pro League club Anderlecht in 2009, where he made his senior debut, at age 16. In his first season, he completed the campaign as the league's top goalscorer, and won the league championship. Following similar individual success in his second season, highlighted by his win of the Belgian Ebony Shoe, Lukaku relocated to England to transfer to Premier League club Chelsea in 2011, for a fee of £10 million (€12 million). Lukaku featured sparingly in his first campaign at Chelsea, and instead, he decided to depart on loan at fellow league club West Bromwich Albion in 2012. Lukaku shone with the team, registering 17 league goals, and guided the club to an unlikely eighth-place finish. However, after no further reassurances over playing time, he again departed on loan, this time to Everton, in 2013. After finishing the season with 15 league goals and helping Everton reach a club-record points tally, he joined the team in a permanent deal worth a club-record fee of £28 million in 2014. After three successful individual campaigns on Merseyside, which included an appearance in the 2016–17 PFA Team of the Year, Lukaku signed for Manchester United in 2017, for an initial fee of £75 million. This transfer made him the most expensive Belgian player of all time. A Belgian international, Lukaku has played 79 games for his country, and registered 45 goals, making him Belgium's all-time top goalscorer. [N1] Lukaku made his senior international debut for Belgium in 2010, at age 17, and has since represented his country at three major tournaments, including two FIFA World Cups and one UEFA European Championship. At the 2018 World Cup, Lukaku led Belgium to a third place finish by finishing as the joint second-highest goalscorer, and won the Bronze Boot. Lukaku joined his local team Rupel Boom at age five. After four seasons at Rupel Boom, Lukaku was discovered by scouts of Lierse, a Belgian Pro League club with an established youth academy. He played for Lierse from 2004 until 2006, scoring 121 goals in 68 matches. After Lierse were relegated from the Belgian Pro League, Anderlecht purchased 13 youth players from Lierse in the 2006 mid-season, including Lukaku. He played three more years as a youth player with Anderlecht, scoring 131 goals in 93 matches. When Lukaku turned 16 on 13 May 2009, he signed a professional contract with Anderlecht lasting until 2012. Eleven days later, he made his Belgian First Division debut on 24 May 2009 in the championship play-off match against Standard Liège as a 69th-minute substitute for defender Víctor Bernárdez. Anderlecht lost the match 1–0. Lukaku became a regular member of Anderlecht's first team during the 2009–10 season, scoring his first goal at senior level against Zulte Waregem in the 89th minute after coming on as substitute for Kanu on 28 August 2009. "After scoring I dived into a sea of happiness," he told Berend Scholten from UEFA.com. "You think you are flying and can take on the whole world." He ended the season as the top goalscorer in the Pro League with 15 goals as Anderlecht won its 30th Belgian title. He also scored four goals during the club's run to the last 16 of the 2009–10 UEFA Europa League. During the 2010–11 season, Lukaku scored 20 goals in all competitions, but Anderlecht failed to retain their league title despite finishing top of the table during the regular season. In August 2011, Lukaku joined Premier League club Chelsea for a fee reported to be around €12 million (£10 million), rising to €20 million (£17 million) in add-ons. Lukaku was given the number 18 shirt and signed a five-year contract. He made his home debut in a 3–1 victory over Norwich City in the 83rd minute, coming on as a substitute for Fernando Torres. Lukaku made his first start for the club in the League Cup against Fulham. Chelsea went on to win the match on penalties. He spent the majority of the season playing for the reserves and started his first Premier League match on 13 May 2012, , against Blackburn Rovers, and turned in a man of the match performance, providing an assist for John Terry's opener. However, Lukaku stressed he was disappointed with his involvement at the end of his debut season, revealing that, after his side's UEFA Champions League win in the final on 19 May, he refused to hold the trophy as he did not feel like a winner. After speculation linking Lukaku to a loan move to Fulham, on 10 August 2012, he joined West Bromwich Albion on a season-long loan deal. He scored his first league goal eight days later, coming on as a substitute in the 77th minute in a 3–0 win against Liverpool. He made his full debut in a win against Reading at The Hawthorns, scoring the match's only goal. On 24 November, Lukaku came on as a 70th-minute substitute for Shane Long and netted a penalty and provided an assist to Marc-Antoine Fortuné, as West Brom defeated Sunderland 4–2 away at the Stadium of Light. The win proved to be West Brom's fourth consecutive win in the top flight for the first time since 1980. On 12 January 2013, Lukaku had his first multi-goal game in the Premier League, giving West Brom a 0–2 lead against Reading, before a late comeback gave the Berkshire club a 3–2 victory at the Madejski Stadium. In the face of claims he wanted to stay with West Brom for another year, asserted by the Daily Mail, Lukaku confirmed to the press he still wished to become a legend at Stamford Bridge. On 11 February, Lukaku came on as a substitute and scored his tenth Premier League goal of the season against Liverpool in a match that ended 2–0. He scored his second brace of the campaign, scoring both goals for West Brom in their 2–1 home defeat of Sunderland on 23 February. On 9 March, in a league match against Swansea City, Lukaku scored the equalising goal before having a penalty kick saved; West Brom eventually won the game courtesy of a Jonathan de Guzmán own goal. On 19 May, coming on as a second-half substitute, Lukaku scored a remarkable second-half perfect hat-trick, as West Brom came from three goals down to draw 5–5 in the season's final home match against Manchester United. The match was Sir Alex Ferguson's 1,500th and last match in charge of United, and the highest-scoring draw in the history of the Premier League. Despite being loaned out by the club, Lukaku outscored all of his Chelsea teammates in the Premier League that season, being the sixth-highest goal scorer of the 2012–13 season with 17 goals. Lukaku played two Premier League matches for Chelsea at the beginning of the 2013–14 season. He also came on as a substitute in the 2013 UEFA Super Cup, ultimately missing the deciding penalty in the shootout as Manuel Neuer saved his shot and Chelsea lost to Bayern Munich. On the final day of the summer 2013 transfer window, Lukaku joined Everton on a season-long loan. The striker made his début for the Toffees away to West Ham United on 21 September 2013, scoring the winning goal in a 3–2 victory for Everton. During the header, he had a collision with a West Ham defender and was taken off the pitch for some treatment. The physio had to tell him he had scored the winner. He scored twice on his home debut nine days later in a 3–2 win against Newcastle United, as well assisting Ross Barkley's goal. He then opened the scoring in a 3–1 defeat to Manchester City in the following match. He continued his impressive start at the club by netting the opening goal in a 2–0 win over Aston Villa, and then scored twice in the first Merseyside derby of the season as Everton drew 3–3 against Liverpool, with Lukaku stating afterwards it was the best experience he has had in his short career. In January 2014, Lukaku was named by The Guardian as one of the ten most promising young players in Europe, but later in the month was taken off on a stretcher with an ankle ligament damage after Gareth Barry slipped and slid into the striker as he attempted to block Steven Gerrard's opening goal in the Merseyside derby against Liverpool. Lukaku made his return from injury against West Ham in March 2014, scoring the only goal of the match on the 81st minute after coming on as a second-half substitute. On 6 April, he scored one goal and assisted another as Everton beat Arsenal 3–0 at Goodison Park to record a sixth consecutive Premier League win. His final goal for the loan period came on the last day of the season as he scored the second in a 2–0 win over Hull City. Lukaku found the net 15 times in 31 league matches to help Everton to fifth place with a club record of 72 Premier League points. Lukaku had signed a five-year deal with Everton in July 2014, for a club record fee of £28 million, and he was assigned the number 10 shirt. He scored his first goal as a permanent player on 13 September, against his former club West Brom. Lukaku did not celebrate the goal, and was applauded by the West Brom fans for his sign of respect. On 19 February 2015, Lukaku scored his first Everton hat-trick in a 4–1 win for Everton against BSC Young Boys in the UEFA Europa League last 32; he struck with a header, a right-foot shot and a left-foot shot. He added another two goals in a 3–1 win in the second leg a week later. With eight goals, he was the tournament's joint highest scorer that season, alongside Alan of red Bull Salzburg. In the second game of the 2015–16 Premier League season, Lukaku scored a first-half double in Everton's 0–3 win at Southampton on 15 August 2015 with his first two shots on target. Before the match, he presented a T-shirt to a home fan whom he had accidentally struck with the ball during shooting practice. On 26 August, he scored another brace in a 5–3 extra-time win over League One side Barnsley in the League Cup. On 28 September, Lukaku scored twice and assisted the other against West Brom as he managed to guide his team from losing 2–0 to winning 2–3. He scored against Liverpool the following week in a 1–1 draw at Goodison Park. On 21 November, Lukaku scored twice in a 4–0 win over Aston Villa, becoming the fifth player under 23 years of age to score at least 50 Premier League goals, after Robbie Fowler, Michael Owen, Wayne Rooney and Cristiano Ronaldo. On 7 December, Lukaku scored a close-range goal in a 1–1 draw against Crystal Palace, his 50th in 100 appearances in all competitions for Everton. 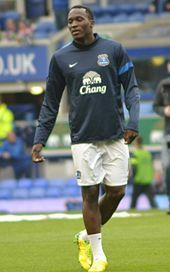 On 12 December, Lukaku became the first Everton player to score in six consecutive Premier League matches, and the first to score in seven consecutive matches in all competitions since Bob Latchford 40 years previously, when he opened the scoring in the Toffees' 1–1 draw with Norwich City at Carrow Road. In his next match, a 3–2 defeat to Leicester City, Lukaku became the first Everton player since Dave Hickson in 1954 to score in eight consecutive matches. On 6 February 2016, Lukaku scored his 20th goal of the season in a 0–3 victory at Stoke City, meaning he was the first Everton player since Graeme Sharp to score at least 20 goals in all competitions in consecutive seasons for Everton. The strike was also his 16th league goal of the season, equalling Premier League goal scoring records for Everton set by Tony Cottee and Andrei Kanchelskis in the mid-1990s. Lukaku followed this goal with another strike in a 0–2 victory at AFC Bournemouth's Dean Court for his 21st goal of the season. This victory sent Everton into the quarter-finals of the FA Cup, and equalled the number of goals scored in all competitions by Yakubu for Everton in the 2007–08 season, the previous best in the Premier League era. On 1 March, Lukaku scored in a 1–3 victory against Aston Villa at Villa Park, his 17th league goal of the season, a Premier League-era record for Everton. The goal also meant Lukaku had equalled his previous best goal return in a league season, set during his loan spell at West Brom in the 2012–13 season. On 12 September 2016, Lukaku scored his first goals of the 2016–17 season with all three goals in a 3–0 against Sunderland at the Stadium of Light. His goals were scored in 11 minutes and 37 seconds, making it the 12th-fastest hat-trick in Premier League history. On 4 February 2017, Lukaku scored four goals, the first of which was Everton's fastest ever Premier League goal, against Bournemouth in a 6–3 victory at Goodison Park. It was also the 300th hat-trick scored in the Premier League. On 25 February 2017, he equalled Duncan Ferguson's club record for Premier League goals, scoring his 60th EPL goal for the Toffees in a 2–0 victory over Sunderland at Goodison Park. On 5 March, he surpassed Ferguson to become the outright record holder, scoring in a 3–2 loss against Tottenham Hotspur away at White Hart Lane. In the next match, a 3–0 home win against West Brom, Lukaku scored to become the first Everton player since Bob Latchford to score 20 or more goals in all competitions for three consecutive seasons. A week later, during a 4–0 victory over Hull City, he scored twice to take his league goals tally to 21 for the season, thereby becoming the first Everton player since Gary Lineker 31 years previously to surpass 20 league goals in a season, as well as being the fourth player and first foreign player to score 80 Premier League goals before the age of 24. In March 2017, Lukaku turned down a new five-year contract worth a reported £140,000 a week amidst rumours of a return to Chelsea. In an interview, he questioned the club's ambition to make big transfers and chase Champions League qualification, offending his manager Ronald Koeman. A goal in a 3–1 win for Everton against Burnley on 15 April meant Lukaku was the first Everton player since Bob Latchford to score 25 goals in two consecutive seasons in all competitions, and the first player since the legendary Dixie Dean to score in nine consecutive matches at Goodison Park. On 20 April 2017, Lukaku was named in the PFA Team of the Year for the first time. He was also included in the six player shortlists for the PFA Player of the Year and PFA Young Player of the Year awards. Lukaku joined Manchester United on 10 July 2017, signing a five-year contract with the option of a further year. Although the fee was officially undisclosed, it was reported to be worth an initial £75 million, plus £15 million in add-ons. Lukaku's signing came a day after former Manchester United captain Wayne Rooney left the club to return to Everton, Rooney's boyhood club. Ahead of the 2017–18 season, Lukaku asked the permission of Zlatan Ibrahimović if he could take over the number 9 shirt from him. Lukaku was confirmed to have been given the number on 14 July. He made his debut against Real Madrid on 8 August in the 2017 UEFA Super Cup, and scored his first competitive goal for the club in a 2–1 defeat. His league debut came five days later at home to West Ham. Lukaku scored twice in a 4–0 win, becoming the fourth Manchester United player to score two goals on his Premier League debut for the club. On 17 September, Lukaku scored United's third goal in a 4–0 win over his former club Everton, with Lukaku running over towards Everton fans and cupping his ears during his goal celebration in response to being booed throughout the game. 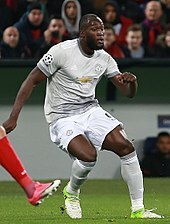 On 27 September, Lukaku scored twice in a 4–1 UEFA Champions League win over CSKA Moscow, taking his tally to 10 goals in his first nine appearances. In doing so, he broke the record set by Sir Bobby Charlton who had scored nine goals in his first nine appearances for the club. In a 2–1 win over his former club Chelsea on 25 February 2018, Lukaku scored the equaliser and then assisted Jesse Lingard's game-winning goal. He scored his 200th goal for club and country on 13 March in a 2–1 away defeat to Sevilla that eliminated Manchester United from the Champions League in the round of 16. On 31 March 2018, Lukaku scored to open a 2–0 home win over Swansea. It was his 100th Premier League goal in his 216th game, and made him the fifth youngest of the 28 players to reach the tally. Lukaku started the 2018–19 season with four goals in his first five appearances, including a brace against Burnley, before a 12-game drought lasting from 19 September to 27 November 2018. Goals against Southampton and Fulham followed before the sacking of manager José Mourinho, only for Mourinho's replacement – former United striker Ole Gunnar Solskjær – to leave Lukaku out of the squad entirely for his first two games in charge against Cardiff City and Huddersfield Town. Lukaku made substitute appearances in United's next two games against Bournemouth and Newcastle United, scoring in both matches within two minutes of coming on. He then played the full 90 minutes of the FA Cup third round tie against Reading, scoring the second goal in a 2–0 win. However, Solskjær continued to prefer to start Marcus Rashford up front and Lukaku started just five of the next nine games, playing the full 90 minutes in just two and failing to score in any of them. His goalscoring form returned for the next three games, as he scored braces against each of Crystal Palace, Southampton and Paris Saint-Germain. The goals against PSG were part of a 3–1 win that saw United through to the Champions League quarter-finals on the away goals rule, the first time any team had progressed after losing at home in the first leg by two goals or more. Lukaku was a member of the Belgium under-21 team and scored a goal on his debut against Slovenia. On 24 February 2010, Lukaku was named for the first time in the Belgium senior squad for a friendly match against Croatia. On 17 November 2010, he scored his first two international goals in a friendly against Russia. Lukaku scored his first goal in almost two years for the national team, netting the winner in a 4–2 friendly victory over rivals the Netherlands on 15 August 2012. On 11 October 2013, Lukaku scored two goals as Belgium defeated Croatia 2–1 to secure a place in the World Cup finals. In May 2014, Lukaku was named in Belgium's squad for the 2014 World Cup. On 26 May, he scored his first international hat-trick in a pre-tournament friendly against neighbouring Luxembourg. However, as Belgium made seven substitutions during this match instead of the permitted six, it was not recognised as an official match by FIFA. On 1 June, he scored first of Belgium's two goals in the 2–0 victory in a friendly match against Sweden. In Belgium's first match of the tournament, a 2–1 win against Algeria in Belo Horizonte, Lukaku started and played 58 minutes before being replaced by Divock Origi. In the round of 16, Lukaku came on as a substitute prior to extra time and assisted Kevin De Bruyne's opening goal three minutes later. In the 105th minute, he scored his first goal of the tournament as Belgium defeated the United States 2–1. On 29 March 2016, Lukaku headed a consolation in a 2–1 loss away to Portugal, assisted by his brother, Jordan Lukaku. At UEFA Euro 2016, Lukaku scored twice in Belgium's 3–0 second group stage match win on 18 June 2016 over the Republic of Ireland. On 10 November 2017, Lukaku equalled the all-time Belgium goalscoring record set by Bernard Voorhoof and Paul van Himst after scoring twice against Mexico in a 3–3 draw. Four days after he equalled the record, Lukaku became the Belgium’s all-time record goalscorer with 31 international goals at the age of 24 after he scored the only goal in a 1–0 win over Japan. Although this record was counted by the Royal Belgian Football Association, FIFA only officially recognised 28 goals after a nullified international friendly match against Luxembourg on 26 May 2014 which he netted a hat trick in a 5–1 win because the former Belgium coach, Marc Wilmots made seven substitutions during the match instead of the permitted six which are not in accordance to the Laws of the Game. On 6 June 2018, Lukaku officially became the Belgium's all-time leading scorer with 31 goals after scoring a goal in a 3–0 win over Egypt. He also broke a three-way tie with the previous record goalscorers, Bernard Voorhoof and Paul Van Himst. On 18 June 2018, Lukaku scored twice in a 3–0 win over Panama in their opening group game at the 2018 FIFA World Cup. In the next group game on 23 June 2018, he scored twice again in a 5–2 win over Tunisia. In doing so, Lukaku became the first player since Diego Maradona in 1986 to score two goals or more in consecutive World Cup matches. He eventually ended the tournament with four goals and one assist, which earned him the Bronze Boot award, as Belgium finished the tournament in third place. Lukaku is a left-footed player, who in 2014 was named by The Guardian as one of the ten most promising young players in Europe. Lukaku has also been known to use his physicality to get around defenders. "Ronaldo changed football. He was the one you would look at. You would see him doing step-overs and you were thinking: 'Who does this?' You would see defenders falling over and you were like: 'Wow.' The goals that he scored, and at crucial times. He scored goals where you were like: 'Oh man, this is not serious.'" —  Lukaku speaking to ESPN on his idol, Ronaldo. Lukaku was born in Antwerp, Belgium to Congolese parents. His father, Roger Lukaku, played professional football and was capped at international level by Zaire. He has a younger brother named Jordan, who has progressed through the youth academy at Anderlecht and currently plays for Lazio in Italy. His cousin Boli Bolingoli-Mbombo plays as a left-sided winger or defender for Austria's Rapid Vienna. Lukaku was the subject of a television documentary series called De School Van Lukaku (Lukaku's School) shown on the Dutch-speaking Eén network. The reality show followed the teenage Lukaku and his classmates during the course of a year at the Saint-Guidon Institute, a school in Brussels, where the footballer was based while with the Anderlecht youth team. In 2009, the series followed the school as it made a field trip to London, visiting Chelsea's Stamford Bridge ground. Lukaku said at the time, "What a stadium. If one day in my life I will cry, it will be the day I play here. I love Chelsea." In addition to his native French and Dutch, Lukaku can speak fluent English, Portuguese, Spanish and a Congolese Swahili dialect, and can also understand German. Lukaku has stated his childhood hero and biggest idol was Didier Drogba. Lukaku is a practising Roman Catholic; he made the pilgrimage to Lourdes in 2014. He does not drink alcohol. Lukaku was the first Premier League player to join Jay-Z's management agency Roc Nation Sports. In 2018, Lukaku signed a record sponsorship deal with German sportswear company Puma, the company’s largest endorsement deal ever. ^ Although this record was counted by RBFA but Lukaku official record was 42 goals because FIFA did not recognised his hat-trick goals against Luxembourg on 26 May 2014 due to Belgium's excessive number of substitutions in that friendly match which were not in accordance to the Laws of the Game. ^ Lukaku caps against Romania on 14 November 2012, against Luxembourg (included his hat-trick goals) on 26 May 2014 and against Czech Republic on 5 June 2017 were counted by RBFA, but not officially recognised by FIFA due to an excessive number of substitutions according to the Laws of the Game. ^ "Lukaku: Romelu Menama Lukaku Bolingoli: Player". BDFutbol. Retrieved 3 June 2018. ^ "Romelu Lukaku". Barry Hugman's Footballers. Retrieved 29 May 2017. ^ "Romelu Lukaku: Overview". Premier League. Retrieved 21 December 2017. ^ "Romelu Lukaku completes Manchester United move in deal that could reach world record £90m". The Telegraph. 19 June 2018. ^ "Duivels winnen geen zieltjes met krappe oefenzege, Lukaku topschutter aller tijden". m.live.sporza.be. ^ "The Full Interview: Teenage Sensation Reveals All About His Life, Loves And His Footballing 'Gift From God'". Goal.com. 17 January 2011. Retrieved 20 January 2011. ^ "Lukaku : " Je sais que je serai récompensé de mes efforts "" (in French). FootGoal.net. 2 September 2009. Archived from the original on 3 September 2009. Retrieved 17 November 2010. ^ "Standard is opnieuw kampioen van België" (in Dutch). Sporza. 24 May 2009. Retrieved 26 May 2009. ^ "Lukaku fast-tracked to the top". Berend Scholten, UEFA.com. 2 March 2010. Retrieved 6 March 2010. ^ a b "Anderlecht's Romelu Lukaku punches his weight and some – aged only 16". The Guardian. 2 April 2010. Retrieved 13 April 2014. ^ "Chelsea striker Romelu Lukaku dreams of playing alongside his brother Jordan". Goal.com. 28 August 2011. Retrieved 13 April 2014. ^ "Chelsea betaalt 12 miljoen voor Lukaku (maar het kan oplopen tot 20 miljoen)". Sportwereld. 12 August 2011. ^ "Chelsea 3–1 Norwich". BBC Sport. 27 August 2011. Retrieved 29 December 2011. ^ Szczepanik, Nick (14 May 2012). "Chelsea cruise against Blackburn Rovers ahead of Champions League final in Munich". The Independent. London. ^ "Romelu Lukaku felt no joy at Chelsea's Champions League win". BBC Sport. 31 May 2012. Retrieved 24 August 2012. ^ "Fulham in talks to loan Lukaku from rivals Chelsea". Goal.com. 17 July 2012. Retrieved 24 August 2012. ^ "LUKAKU WEST BROM LOAN". chelseafc.com. 10 August 2012. Archived from the original on 11 August 2012. Retrieved 10 August 2012. ^ McNulty, Phil (18 August 2012). "West Brom 3–0 Liverpool". BBC Sport. BBC. Retrieved 3 September 2013. ^ "West Brom 1–0 Reading" BBC Sport. 22 September 2012. Retrieved 14 January 2013. ^ "Sunderland 2 West Brom 4: Albion rewrite the history books as they go up to third". Daily Mail. 24 November 2012. ^ "West Brom went third in the Premier League after recording four successive top-flight wins for the first time since 1980 with victory at Sunderland". BBC Sport. 24 November 2012. Retrieved 5 February 2013. ^ "Reading 3–2 West Bromwich Albion". ESPNFC. 12 January 2013. ^ "I don't care what Chelsea are doing at the moment: Lukaku wants to stay at West Brom". Daily Mail. 14 January 2013. ^ "Romelu Lukaku believes he can become a legend at Chelsea". Sky Sports. 5 February 2013. ^ "Gareth McAuley and Romelu Lukaku scored late goals as West Brom pinched a remarkable victory at Liverpool to end a sequence of six games without a win". BBC Sport. 11 February 2013. ^ "West Brom 2 Sunderland 1: Lukaku at the double as Baggies ease past Black Cats". Daily Mail. 23 February 2013. ^ "Romelu Lukaku continued his good form as West Brom beat Swansea to move up to seventh in the Premier League". BBC Sport. 9 March 2013. ^ "West Brom 5 Manchester United 5: Fergie's career ends with ten-goal thriller". Daily Mail. 19 May 2013. Retrieved 19 May 2013. ^ "Manchester United share 10 goals with West Brom in Alex Ferguson's finale". The Guardian. 19 May 2013. Retrieved 19 May 2013. ^ "Will Romelu Lukaku come back to haunt West Bromwich Albion?". Metro. 18 January 2014. Retrieved 4 August 2014. ^ UEFA.com. "UEFA Super Cup - 2013: Neuer puts an end to Chelsea hopes". UEFA.com. Retrieved 2018-09-30. ^ "Transfer deadline day: Everton sign James McCarthy and Romelu Lukaku, Lukaku scored on his debut after replacing Steven Naismith at half time". Sky Sports. BSkyB. 3 September 2013. Retrieved 3 September 2013. ^ "West Ham 2–3 Everton". BBC Sport. 21 September 2013. ^ "Everton 3–2 Newcastle" BBC Sport. 30 September 2013. Retrieved 7 October 2013. ^ "Manchester City 3–1 Everton" BBC Sport. 5 October 2013. Retrieved 7 October 2013. ^ "Aston Villa 0–2 Everton". BBC Sport. Retrieved 1 December 2013. ^ "Romelu Lukaku claims Everton's draw with Liverpool is the 'best derby' he has played in". Sky Sports. Retrieved 1 December 2013. ^ a b "The next 10 big things: Europe's top youngsters and stars of the future". The Guardian. 18 January 2014. ^ "Romelu Lukaku: Everton striker out for 'weeks rather than months'". BBC Sport. Retrieved 29 January 2013. ^ "Liverpool 4–0 Everton". BBC Sport. Retrieved 29 January 2014. ^ "Everton 1–0 West Ham". BBC Sport. Retrieved 1 March 2014. ^ "Everton 3–0 Arsenal". BBC Sport. 6 April 2014. Retrieved 13 April 2014. ^ "Hull City 0–2 Everton". BBC Sport. Retrieved 26 May 2014. ^ "Magic Numbers: Roberto's Record-Breakers". Everton F.C. Retrieved 26 May 2014. ^ "Romelu Lukaku: Everton sign Chelsea striker". BBC Sport. 30 July 2014. Retrieved 27 June 2017. ^ "BSC Young Boys 1–4 Everton". BBC Sport. 30 July 2014. Retrieved 30 July 2014. ^ Baker, Ian (26 February 2015). "Everton 3–1 BSC Young Boys". BBC Sport. Retrieved 27 February 2015. ^ "Alan and Everton's Lukaku finish as top scorers". UEFA. 27 May 2015. Retrieved 27 May 2015. ^ Lewis, Aimee (15 August 2015). "Southampton 0–3 Everton". BBC Sport. Retrieved 16 August 2015. ^ "BBC Sport – Barnsley 3–5 Everton (AET)". BBC Sport. 26 August 2015. Retrieved 27 August 2015. ^ "West Brom 2–3 Everton". BBC Sport. 28 September 2015. Retrieved 4 October 2015. ^ "Everton 2–3 Liverpool". BBC Sport. 4 October 2015. Retrieved 4 October 2015. ^ "Romelu Lukaku becomes fourth-youngest player to score 50 goals before turning 23 in Premier League history". Daily Mail. 21 November 2015. Retrieved 22 November 2015. ^ "Everton 1–1 Crystal Palace: Romelu Lukaku secures point for hosts". ^ "Can Romelu Lukaku break Jamie Vardy's Premier League goalscoring record?". The Irish Examiner. 12 December 2015. ^ Corking, Graham. "Everton's Romelu Lukaku breaks a 61-year record after goal against Leicester". ^ "Record-breaking Lukaku happy to help team – NSNO". ^ "Bournemouth 0–2 Everton". BBC Sport. 20 February 2016. ^ "Yakubu Ayegbeni – Everton Football Club". ^ Kirkbride, Phil (1 March 2016). "Aston Villa 1–3 Everton full-time report: Blues go into top half after cruise". ^ "Romelu Lukaku – Football Stats – Everton – Age 23 – Soccer Base". ^ "Sunderland 0–3 Everton". BBC Sport. 10 September 2016. ^ "Everton 6 Bournemouth 3: Romelu Lukaku scores Toffees' fastest Premier League goal in Goodison rout". The Telegraph. 4 February 2017. ^ "Revealed: The 20 Premier League teams who have scored most hat-tricks in history of competition". The Telegraph. 7 February 2017. Retrieved 22 March 2018. ^ "Everton 2–0 Sunderland: Romelu Lukaku equals club record in win". Skysports.com. 25 February 2017. ^ "ROMELU LUKAKU: EVERTON'S LEADING PREMIER LEAGUE GOALSCORER". Liverpool Echo. 7 March 2017. ^ "EFC Statto on Twitter". ^ Hafeez, Shamoon (19 March 2017). "Premier League statistics: Arsenal, Mahrez, Vardy, Lukaku, Deeney". BBC Sport. Retrieved 21 March 2017. ^ McNulty, Phil (14 March 2017). "Romelu Lukaku: Everton striker rejects new contract at Goodison Park". BBC Sport. Retrieved 21 March 2017. ^ "Romelu Lukaku must respect Everton contract – Ronald Koeman". BBC Sport. 16 March 2017. Retrieved 21 March 2017. ^ Gorst, Paul (15 April 2017). "How Lukaku has made history in stunning Everton season". ^ a b "PFA teams of the year: Chelsea and Tottenham dominate Premier League XI". BBC Sport. 20 April 2017. Retrieved 6 May 2018. ^ "Men's PFA Young Player of the Year 2017". The Professional Footballers Association. 13 April 2017. ^ "United sign Romelu Lukaku". ManUtd.com. Manchester United. 10 July 2017. ^ "Romelu Lukaku: Man Utd sign Everton striker for initial £75m". BBC Sport. 10 July 2017. Retrieved 10 July 2017. ^ "Rooney to join Everton". ManUtd.com. Manchester United. 10 July 2017. Retrieved 10 July 2017. ^ Dawson, Rob (10 July 2017). "Romelu Lukaku to wear No. 9 shirt at United with Ibrahimovic's permission". ESPN FC. ESPN Sports Media. Retrieved 15 July 2017. ^ Tuck, James (14 July 2017). "Lindelof and Lukaku shirt numbers revealed". ManUtd.com. Manchester United. Retrieved 15 July 2017. ^ "Real Beat Man Utd in Super Cup". BBC Sport. 8 August 2017. Retrieved 13 August 2017. ^ "Manchester United 4–0 West Ham United". BBC Sport. 13 August 2017. Retrieved 13 August 2017. ^ "Lukaku joins exclusive club with debut double". Premier League. 14 August 2017. Retrieved 15 August 2017. ^ "Everton fans unhappy with Romelu Lukaku's goal celebration". Liverpool Echo. Retrieved 13 October 2018. ^ "Jose Mourinho says Romelu Lukaku's form amazing but Man Utd team-mates deserve credit too". Sky Sports. 28 September 2017. Retrieved 29 September 2017. ^ Oscroft, Tim (25 February 2018). "Manchester United 2–1 Chelsea". BBC Sport. Retrieved 16 March 2018. ^ Rodger, James (14 March 2018). "Romelu Lukaku reacts to scoring his 200th goal as Manchester United exit Champions League". Birmingham Mail. Retrieved 16 March 2018. ^ Wright, Nick (31 March 2018). "Romelu Lukaku's 100 Premier League goals in stats". Sky Sports. Retrieved 31 March 2018. ^ Chowdhury, Saj (30 December 2018). "Man Utd 4-1 Bournemouth: Ole Gunnar Solskjaer says he is not purely focused on attack". BBC Sport. Retrieved 12 March 2019. ^ Johnston, Neil (2 January 2019). "Newcastle United 0-2 Manchester United: Ole Gunnar Solskjaer wins fourth game from four". BBC Sport. Retrieved 12 March 2019. ^ Davis, Matt (5 January 2019). "Manchester United 2-0 Reading in FA Cup third round". BBC Sport. Retrieved 12 March 2019. ^ Hafez, Shamoon (27 February 2019). "Crystal Palace 1-3 Manchester United: Romelu Lukaku double helps visitors to victory". BBC Sport. Retrieved 12 March 2019. ^ Johnston, Neil (2 March 2019). "Manchester United 3-2 Southampton". BBC Sport. Retrieved 12 March 2019. ^ Hafez, Shamoon (6 March 2019). "Champions League: PSG 1-3 Man Utd (agg: 3-3)". BBC Sport. Retrieved 12 March 2019. ^ "Romelu Lukaku est officiellement Diable Rouge" (in French). DH.be. 24 February 2010. Retrieved 17 November 2010. ^ "Russia vs Belgium Player Ratings". Goal.com. 17 November 2010. ^ "Belgium 4–2 Netherlands: Mertens inspires impressive win for hosts". Goal.com. 15 August 2012. ^ "Croatia 1 Belgium 2: Lukaku double secures World Cup qualification for Red Devils". Daily Mail. 11 October 2013. Retrieved 11 October 2013. ^ "Belgium 5–1 Luxembourg". BBC. 26 May 2014. Retrieved 27 May 2014. ^ "Debuut Bossut en Januzaj, én hattrick Lukaku zijn ongeldig" (in Dutch). Het Laatste Nieuws. 4 June 2014. Retrieved 4 June 2014. ^ "Lukaku and Hazard score in comfortable Belgium win over Sweden". Yahoo Eurosport UK. 1 June 2014. Retrieved 1 June 2014. ^ Chowdhury, Saj (17 June 2014). "Belgium 2–1 Algeria". BBC Sport. Retrieved 22 June 2014. ^ "Belgium 2–1 USA". BBC. 1 July 2014. Retrieved 2 July 2014. ^ Gill, Kieran (29 March 2016). "Portugal 2–1 Belgium: Romelu Lukaku heads home cross from brother Jordan after Cristiano Ronaldo and Nani strike for hosts". Daily Mail. Retrieved 29 March 2016. ^ Wallace, Sam (18 June 2016). "Belgium 3 Republic of Ireland 0: Lukaku double leaves Irish needing win against Italy to progress". The Daily Telegraph. Retrieved 18 June 2016. ^ "Romelu Lukaku equals all-time Belgium goalscoring record". Sky Sports. 11 November 2017. Retrieved 12 November 2017. ^ "Manchester United striker Romelu Lukaku breaks Belgium goalscoring record at the age of 24". Metro. 14 November 2017. Retrieved 15 November 2017. ^ "Alle Rode Duivels" (in Dutch). belgianfootball.be. Retrieved 17 November 2017. ^ "FIFA doesn't recognise Romelu Lukaku all-time goals record for Belgium". ESPN FC. 15 November 2017. Retrieved 16 November 2017. ^ "Why FIFA does not recognise Romelu Lukaku as Belgium's all-time record goal scorer despite him netting his 31st". Mirror. 15 November 2017. Retrieved 15 November 2017. ^ "Romelu Lukaku becomes Belgium's all-time leading scorer in win vs. Egypt". ESPN. 6 June 2018. Retrieved 8 June 2018. ^ "World Cup 2018: Belgium best debutants Panama 3-0 in Sochi". BBC. Retrieved 19 June 2018. ^ "World Cup 2018: Belgium v Tunisia". BBC Sport. 23 June 2018. Retrieved 23 June 2018. ^ "Red-hot Lukaku makes World Cup history for Belgium". goal. Retrieved 23 June 2018. ^ a b "Luka Modric wins World Cup Golden Ball; Mbappe and Courtois also honoured". ESPN FC. 15 July 2018. Retrieved 15 July 2018. ^ Veysey, Wayne (6 August 2011). Belgium international shares his dreams and ambitions and reveals his intention to learn from the Ivorian at Stamford Bridge. Goal. Retrieved on 24 December 2014. ^ a b c Smith, Rory (30 March 2016). "Ronaldo deserves more credit as one of the game's greatest players". ESPN. Retrieved 25 August 2018. ^ "Romelu Lukaku". ESPN Soccernet. Retrieved 28 March 2011. ^ a b Wilson, Jeremy (28 October 2010). "Jose Mourinho and Real Madrid rival Chelsea for 'new Didier Drogba'". The Daily Telegraph. London. Retrieved 6 August 2011. ^ "Menama Lukaku". FIFA. Archived from the original on 9 November 2012. Retrieved 6 August 2011. ^ CalcioNews24, Redazione (21 July 2016). "Lazio, è arrivato Jordan Lukaku: ora visite e firma – Calcio News 24". ^ "Rapid verpflichtet Bolingoli-Mbombo von Brügge" (in German). Sky Sports. 22 June 2017. Retrieved 31 March 2018. ^ Is it true Romelu Lukaku starred in a documentary tv series about his schooldays? Socqer.com retrieved 7 August 2011. ^ Chelsea new signing Romelu Lukaku says move to Stamford Bridge is a dream come true. The Daily Telegraph, 8 August 2011. ^ Lepkowski, Chris (24 August 2012). "West Brom feature: Chris Lepkowski talks to multi-lingual Romelu Lukaku about his life and career". Birmingham Mail. Retrieved 24 August 2016. ^ "West Brom loan star Lukaku tired of comparisons with Drogba". Daily Mail. 23 September 2012. ^ Bulman, May (27 July 2017). "Romelu Lukaku: British tabloids wrongly claim black Christian footballer is 'devout Muslim'". The Independent Online. Independent Digital News & Media. Retrieved 31 July 2017. ^ "ROMELU LUKAKU". roc nation. 1 March 2018. Retrieved 1 March 2018. ^ "Manchester United's Romelu Lukaku signs record Puma sponsorship deal". ESPN. 19 June 2018. ^ a b c d e "R. Lukaku". Soccerway. Perform Group. Retrieved 22 January 2018. ^ "Games played by Romelu Lukaku in 2011/2012". Soccerbase. Centurycomm. Retrieved 29 May 2017. ^ a b "Games played by Romelu Lukaku in 2013/2014". Soccerbase. Centurycomm. Retrieved 29 May 2017. ^ "Games played by Romelu Lukaku in 2012/2013". Soccerbase. Centurycomm. Retrieved 29 May 2017. ^ "Games played by Romelu Lukaku in 2014/2015". Soccerbase. Centurycomm. Retrieved 29 May 2017. ^ "Games played by Romelu Lukaku in 2015/2016". Soccerbase. Centurycomm. Retrieved 29 May 2017. ^ "Games played by Romelu Lukaku in 2016/2017". Soccerbase. Centurycomm. Retrieved 20 July 2017. ^ "Games played by Romelu Lukaku in 2017/2018". Soccerbase. Centurycomm. Retrieved 8 March 2019. ^ "Games played by Romelu Lukaku in 2018/2019". Soccerbase. Centurycomm. Retrieved 16 April 2019. ^ "Romelu Lukaku". EU Football. Retrieved 2 April 2018. ^ "Romelu Lukaku". Royal Belgian Football Association. Retrieved 13 September 2017. ^ "Origi awarded Promising Talent honour". Liverpool F.C. 16 December 2014. Retrieved 6 July 2017. ^ "'New Drogba' to snub Real Madrid". Eurosport.com. 11 August 2010. Retrieved 6 July 2017. ^ "The Belgian Ebony Shoe 2014 goes to Standard Liège's Michy Batshuayi". Benefoot. 6 May 2014. Retrieved 27 October 2014. ^ a b "Barry Claims Awards Double". Everton F.C. 15 May 2016. Retrieved 10 July 2017. ^ "Romelu Lukaku: Overview". Premier League. Retrieved 29 September 2018. ^ a b "Rom Bags Double at Dixies". Everton F.C. 9 May 2017. Retrieved 10 July 2017. ^ "Man Utd striker Romelu Lukaku HAMMERS Kane, Morata and Aguero in PFA vote". Manchester Evening News. Retrieved 4 October 2017. ^ a b "Rules & Governance – Law 3: The number of players". The Football Association. Archived from the original on 25 October 2014. Retrieved 1 June 2016. ^ "Romelu Lukaku has not officially broken Belgium's goalscoring record according to FIFA due to illegitimate hat-trick scored earlier in his career". Daily Mail. 15 November 2017. Retrieved 19 November 2017. ^ "Football MATCH: 05.06.2017 (Belgium v Czech Republic)". EU Football. Retrieved 19 November 2017. 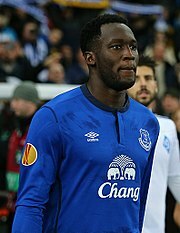 Wikimedia Commons has media related to Romelu Lukaku.